Mon, Oct 22, 2018, 10:58 pm SL Time, ColomboPage News Desk, Sri Lanka. Oct 22, Colombo: Sri Lankan President Maithripala Sirisena today said the United National Party, the coalition party of his government was formed as a strong political party by the great characters who led the party and wished the party would be led by such great leaders again. Addressing the commemoration ceremony of the first Prime Minister of Sri Lanka D.S. Senanayake and other Senanyakes held at the BMICH, today (22), the President said the UNP was formed as a strong political party because of great characters who were true patriots who inherited our values and free of corruption, fraud, malpractices and waste. "I hope for the future of country that this political policy once again include those objectives in the party," he said. Delivering the commemorative speech President Sirisena said that patriotism, justice and honesty were among the significant individualities of the pioneers of the UNP like D.S. Senanayake and recalled that there were no room for fraud and corruption in those characters. 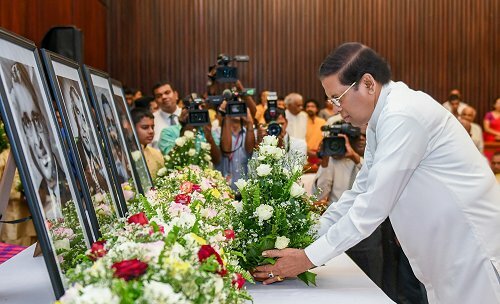 President Sirisena also recalled with gratitude the service rendered by D.S. Senanayake for the economy and development of the country through the initiative like Govi Janapada. The President garlands the photographs of four Senanayakes. The Speaker Karu Jayasuriya, former Minister Vasudeva Nanayakkara, Imthiaz Bakeer Markar, Rukman Senanayake and the relatives of the Senanayake family participated on this occasion.